ALABAMA: Online Donations Pour In For Doug Jones - Joe.My.God. 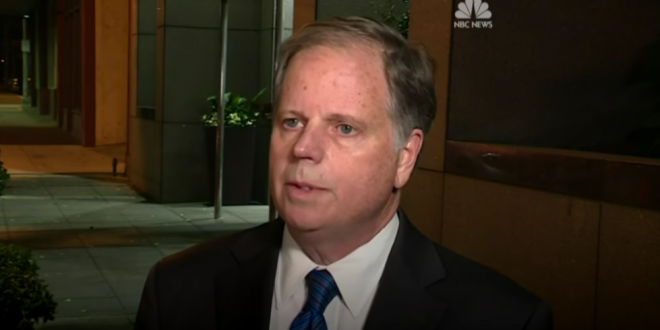 The Roy Moore scandal has unleashed a torrent of online donations to Democrat Doug Jones, who was collecting around $250,000 per day in its immediate aftermath, according to two sources familiar with the matter who spoke to NBC News on condition of anonymity. Democrats may end up in the unlikely situation of dramatically outspending the GOP in the Senate contest in deep red Alabama now that national Republicans have abandoned Moore. The Republican candidate’s bank account had been depleted by a tough primary battle even before nine women came forward to accuse of him of sexual impropriety. The scandal has super-charged Jones’ already robust online fundraising to “Ossoff-level money,” as one Democrat put it, referring to failed Democratic congressional candidate Jon Ossoff, who amassed a staggering $30 million in a Georgia special election this year.